Hosting your own Web Servers takes skill, understanding of security, and the ability to monitor the server at all hours of the day. It also takes a lot of man-hours. For more than a decade, maintaining a Web Server has been a necessary task for any business doing business on the Web, but one that drained resources. Tasks like rebooting crashed servers, patching vulnerabilities and responding to security breaches, require near constant monitoring and maintenance. Many businesses are now finding better uses for those man hours by outsourcing Web server hosting to the cloud, where they not only find dedicated resources, but expertise they might not have possessed on their own staff, especially in security, backup and recovery, speed, customer service and availability. Hackers are always trawling the Internet seeking vulnerable websites. A business's website is a target for attack almost as soon as it goes live. The hacker’s number one goal is to gain access to secure websites and steal the company data. When the site is hosted on an internal Web server, the site owner is responsible for all security that can be compromised by hackers. Many business owners don’t have the luxury of hiring expensive security experts or owning expensive hardware equipment. A hosted solution puts that burden in the hands of the cloud provider, who typically have more experience securing Websites, letting the business owner focus on customer issues and making money instead of worrying about hackers. Every website should have a disaster recovery plan laid out in case of an emergency, including if the Web server is hacked or crashes. Backups for your data are integral parts of disaster recovery plans in case you need to retrieve lost data. Hosting content on a cloud computing network automates the backup process. The cloud computing host always keeps a recovery file set on the host network, so the website is up and running quickly even after a major server crash. All businesses must invest in high-speed bandwidth to host a website internally. Users bounce off of a website when it is too slow, so an internal network and the Internet bandwidth must support the traffic sent to the Web server. This issue is not a problem when the website is hosted on a cloud computing host. Cloud computing servers are fast, reliable and able to scale, allowing users to access the website quickly and without any bandwidth issues. How well do you know Apache or Internet Information Services (IIS) website configurations? If you are unsure of how to configure a website properly in the server’s configuration utility, you can find the website offline or improperly configured and without any help to fix it. Aside from searching the Internet, you are left to figure out your mistake alone, and the site remains offline until you figure out the problem. Using a cloud hosting service gives you the ability to call technical support when you are stuck on server configuration issues. The service is priceless when faced with a server configuration question, especially for business owners stuck with a crashed server. Accidentally deleted data on the cloud server? Not a problem with cloud hosting. The admins can get the site back up and running without any hassle to the business owner. Since cloud computing has become mainstream, software developers have created thousands of apps available for business owners. These apps are free or inexpensive, so the business owner doesn’t need to come up with much money to get started. 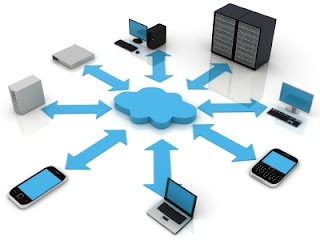 Cloud computing apps come with all different price tags, but each one is compatible with any cloud computing Web host. This means you don’t need to install expensive apps on a private Web server to get started with a new business site, and you do not incur the higher cost of local Web server apps. Entrepreneurs have much to deal with when growing and nurturing a business. Cloud Computing takes away many of the technology tasks required to run a business website, and you lower costs associated with running a private Web host. These five benefits outweigh the responsibility and requirements needed to host, manage and maintain your own Web server. Rackspace® Hosting is the service leader in cloud computing providing Fanatical Support® to customers across a portfolio of IT services, including Managed Hosting and Cloud Computing.